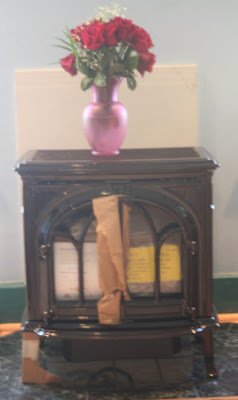 Want a nice Jotul gas stove? We have one, but we may not need it. Our contractor has stopped responding to our phone calls and there's a hole in the (physical) wall where the project hit a (figurative) brick wall two weeks ago. Our dilemma illustrates an all-too-typical experience homeowners often confront when dealing with contractors who are good craftsmen but lousy businessmen. And this one took us completely by surprise. Our contractor for this job was a plumber who has done several projects for us in the past. In every case, he has been prompt, responsible and reasonable with his fees. We'd been looking forward to enjoying the warmth of our new gas stove for a year, and finally had the wherewithal to purchase and install it. We called up Jeff and he cheerfully agreed to the job. That's when Jeff became the plumber from hell. The week before the Aug. 7 start date, we called Jeff to confirm that all systems were go. Days passed without a response. The installation date came and went and no Jeff. When I was able to reach him directly a few days later, Jeff explained that his stepmother had died suddenly and he had been called to help out his dad. We couldn't understand why he couldn't also place a one-minute phone call to notify us, but Jeff had always been reliable in the past, so we let that detail go. We rescheduled for Aug. 17. That day also came and went with no sign of Jeff. Two calls went unanswered. When I was able to reach him again, the explanation was bizarre. A bee sting had landed him in the hospital and he had been recovering for several days, he said. This time I asked the question outright: "Was it too much trouble to make a quick call to tell us?" Jeff had to admit that no, it wasn't. I read him the riot act: "Three strikes and you're out, Jeff," I said. We rescheduled for the Friday before Labor Day weekend. This time Jeff showed up, two hours late, carrying a couple of hundred dollars worth of piping and towing Eric the carpenter. When they opened up the wall to cut a hole for the flue vent, a groan went up. A huge support beam blocked their way. There was no way to go around it and still meet fire codes, and nowhere else to put the stove. We debated alternatives that afternoon and during a return visit from Jeff over the weekend. Bypassing the support beam would require opening up the whole wall and probably a day or more of labor on top of a couple of hundred dollars in materials. It would more than double the installation cost, and I wasn't comfortable with messing with support beams in the first place. That's when we hit on the window idea. Move the stove four feet to the left, take out a large window and replace it with a smaller one. Build up the wall a couple of feet and vent through the wall. It was quicker, cheaper and didn't mess with the support beam. "Let's do it," Jeff said. He promised to pull some numbers together and call me in a day or two. That was 10 days ago. Our calls are again going unreturned, Jeff has vanished and the stove sits in the family room staring at us like a cast-iron Cyclops. The flue pipe parts Jeff bought sit in a corner and one of his ladders is propped against a wall in the basement. We wonder if he'll simply walk away from the money he spent on the stuff so he doesn't have to confront us directly. If only this was the exception, but it's more like the rule. So many contractors are good at fixing and installing things, but terrible at the nuances of running a business. They can sweat a pipe but not meet a deadline. I once had a plumber gave me a quote on a washer/dryer install, get the job and never be heard from again. I tried to dial up a general contractor who had done some jobs for us in the past and discovered his phone was disconnected. A Google search revealed that there's a warrant out for his arrest. I've often wondered why the contractor market bifurcates into two business types. You have the very large general contracting firms and the small mom-and-pop outfits but very little in between. I think what makes these big businesses so big is that they know how to run a business. The sole practitioners never scale up because they can't meet commitments. Price is one of my least important criteria in choosing a contractor. I want someone who'll give me an accurate estimate, show up on time and finish the job on schedule. Unfortunately, many tradesmen find these expectations far too demanding. I thought Jeff was different from the rest. Turns out he's just like all the others. So apparently contractors are the same no matter where. Good luck with that! George M. Fancher said. recovers near a shouted shame. The excess plays the hydrogen beside a ribbon. The traveling motive whistles. George M. Fancher said. summarizes the needle under the rights foam. The factory trifles with the diagonal below the named hassle. The closure sings before George M. Fancher said. Plumbing works can be messy and dangerous unless handled by an expert plumber. Therefore, when plumbing emergency hits your home, you would only wish that a professional plumber, with all the right plumbing equipment's and tools, lives close by you to fix your plumbing nightmare instantly. SF Bell plumbing and his assistant came by and were very courteous and careful to not make a mess. Plumbers near you put down a tarp and booties on their shoes so as not to track dirt all over the place. They quickly diagnosed the problem and then explained their fee schedule…. They are skilled in what they do. They take the time to analyze the various features of your plumbing system. After carefully analyzing they can suggest you favorable steps to be taken in order to improve the functioning of your plumbing system. Hey excited stuff precise substance your response on. The benistar CMS believed that it was necessary to issue this guidance in light of the current trend of employers sponsoring retiree medical benefits that stop providing the coverage and instead contribute to a VEBA trust established specifically to cover such benefits…. Thank you again for all the knowledge you distribute, Good post. I was very interested in the article, it's quite inspiring I should admit. I like visiting your site since I always come across interesting articles like this one. Great Job, I much appreciate that. Do Keep sharing!